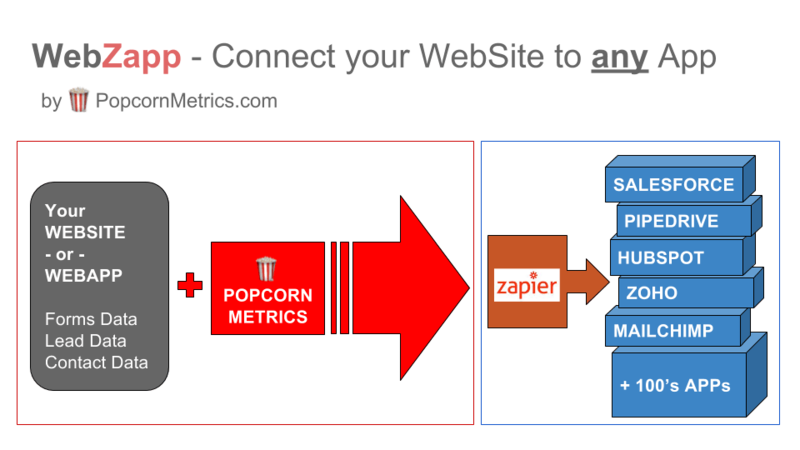 We’re building a Zapier Integration to Push Web Leads to your CRM / Email Marketing Automation Tools - Here’s Why. We want to help automate your Sales & Marketing Processes. Especially automating getting leads data INTO your Email Marketing and CRM tools. We’re pretty sure if you take Sales seriously, then you’ll be using a CRM tool like Salesforce, Sugar CRM, Zoho CRM, PipeDrive, or with your email marketing automation you’re likely using tools like Hubspot or Mailchimp (depending on your needs). We see our a Zapier Integration giving you an edge - in letting you push Leads direct from your Website/Landing pages to your CRM tools, or email marketing automation tools - or possibly both. Automatically track User Onboarding in your CRM Tool (e.g. New Lead in Salesforce, or Close.io) - again this could be to manage users on Trial, when they signup to push them direct into your CRM tool so you can manage the Onboarding Process for individual (high value?) users. Automatically add an Email to Additional Lists in your Email Marketing Automation tools. Suppose you have a signup form for a Free Email Course or a PDF/Ebook Download. That will probably put the lead into an Automation process for the Course/Download - but you may ALSO want to send that lead to your Main Emailing List. So we’d hope to make it easy to Send the Lead to additional lists. These are just some initial use cases we’ve encountered. What challenges do you have that we could solve? To get Priority Access to the Invite Only Beta - please signup here. Here's just some of the email marketing automation tools you could be using. In brief we want to make it easy (i.e. AUTOMATE) the process of getting Leads into the right Email Marketing Automation tools so you can manage them effectively. Our Goal remains consistent with Popcorn Metrics. We’ll send the data to the right place, so you can use and get the best from your data in those tools. Getting a little more advanced, we’d like to also help you automate more tasks, for example in your deals/leads pipeline. Here are some of the 90 or so CRM tools you could be using in Zapier. For example, let’s say you work in a B2B SaaS business and when someone signs up for a Webinar or Trial, they might automatically enter your deal flow in what ever process matches inside Saleforce, PipeDrive etc. But we’d like you to be able to AUTOMATICALLY update/segment Deals/Leads/Prospects as they take more action, say moving from Download a Case Study to Start a Trial. (A lead starting a Trial may be more valuable and hence this wuould be valuable inside your CRM tools) Or a Lead/Deal/Prospect could AUTOMATICALLY close when they enter their Payment Details online. Most Zapier integrations connect two existing apps. We want to go further, so your Website or Landing Page can be like an "app" and push data directly into CRM & Email Marketing Automation tools. OK, so that’s the broad vision. We’re pretty sure there’s 00’s of other uses we haven’t even thought of!! We’d really love to understand better how we can make your Sales Pipeline & Marketing Automation processes run more smoothly. We know a bit about inbound, but don’t have a heavy sales focus at them moment, being more focused on Inbound, so we’d especially like to talk with you about that. From the CRM tools/email marketing automation side, we’d really love to understand better how we can make this technology work to make your Sales Pipeline & Marketing Automation processes run more smoothly, without the expense and tedium of manual entry tasks. If you are a Digital Agency that generates leads for Clients, we think we can possibly be REALLY helpful so you can put leads direct into your clients’ CRM tool. To get Priority Access to the Invite Only Beta >> [signup here].